The document references 2003/XP, but the only difference for us 2008/Vista users is the location of the policy settings. 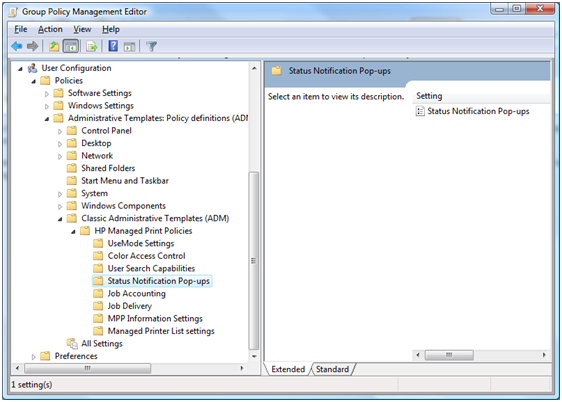 Since the HP_MPP_2.ADM file is an ADM and not an ADMX file, the settings will be displayed under the Classic Administrative Templates folder of the Group Policy Management Editor. I found the most useful setting to be Status Notification Pop-ups. The HP Universal Print Driver will, by default, display pop-up informational messages such as ‘Now Printing’, ‘Toner Low’, or other potential annoyances while printing. These messages caused the most complaints and confusion from my users, so I just turned them off via Group Policy. You say you turn off informational messages such as ‘Now Printing’ via Group Policy, how is that done?